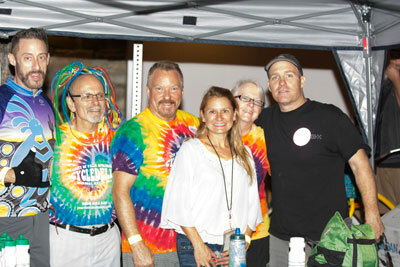 The City of Palm Springs’ Office of Sustainability in cooperation with the Palm Springs Bike Coalition, Hot Purple Energy and Hocker Productions will present Cycledelic. This colorful, fluorescent and glow-in-the-dark bike ride and vendor festival will take place Thursday, April 30, 2015 and coincide with the weekly Villagefest in downtown Palm Springs and is part of the non-motorized transportation initiative to encourage more bike riding. Cycledelic is a FREE, fun and easy downtown loop bike ride suitable for all ages. All bike riders are required to wear helmets and obey all traffic laws, signage and routes for Cycledelic. 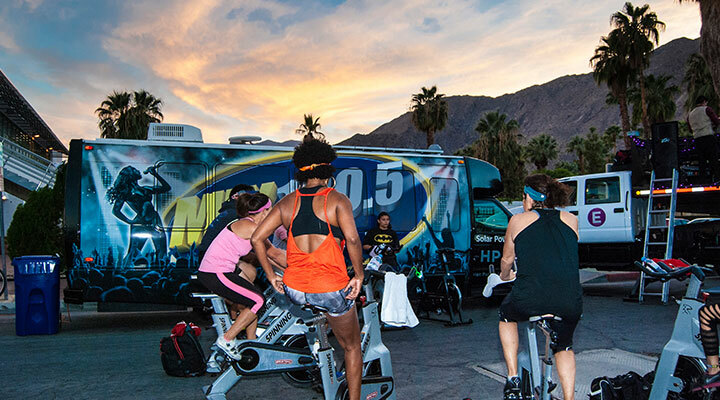 Bike riders will gather at the festival area located at the Northwest corner of Tahquitz Canyon Way situated between Palm Canyon Drive and Belardo Road starting at 6:00p.m. Pilates Plus will host stretching and free spinning classes onsite to get warmed up for the ride. Big Wheel Tours will offer bike rentals and PS Cyclery will offer bike valet service. While supplies last, bike lights and glow in the dark decorations will be distributed on a first-come, first-serve basis. A short instruction seminar will be given at approx., 7:15p.m, focusing on bike safety, tips to navigate vehicle traffic, locking your bike and what gear should be worn for nighttime riding. Cycledelic would not be possible without the support of City of Palm Springs Office of Sustainability, Villagefest, Hot Purple Energy, Palm Springs Cyclery, Pilates Plus and Chandler Coldwell, Arrowhead Spring Water, Big Wheel Tours, Nature’s Health Food and Café, CREE Network, EOS Fitness, Palm Springs Police Department, Mix 100.5 FM, Compete Magazine, City of Palm Springs Park and Recreation Department and Friend’s of CV Link. Cyclists will meet on Tahquitz Canyon Way between Palm Canyon Drive and Belardo Road in Palm Springs between 6:00-7:00p.m. At 7:30p.m, riders will take off and travel southbound on South Belardo Road. Riders will continue all the way down and over the Richard M. Milanovich Memorial Bridge and continue on Belardo until they reach the curve just before it intersects with South Palm Canyon Drive doing 2 loops to complete the 7-mile fun ride. PS Cyclery will provide bike valet until 10:00p.m.For updates, visit www.HealthyPlanetHealthyYouPS.com or the Palm Springs Office of Sustainability www.YourSustainableCity.com.